Researchers at Rothamsted Research, an Institute of the Biotechnology and Biological Sciences Research Council, and at the University of Greenwich have explained a characteristic feature of insect migration that has puzzled researchers for over 40 years: how do insects maintain wind-related orientation at altitudes of several hundreds of metres in the dark? 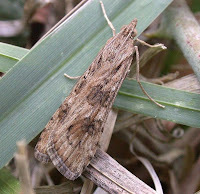 The environmental cues used by nocturnal insect migrants to select and maintain common headings, while flying at altitudes of several hundreds of metres above the ground in low illumination levels, and the adaptive benefits of this behaviour, have long remained a mystery. Studies made with both entomological and meteorological radars have frequently reported the occurrence of insects moving in layers, and that the individuals forming these layers often show a considerable degree of uniformity in their headings – behaviour known as ‘common orientation’. This theory accounts for flight behaviour of many medium-sized (10-70 mg) insect species flying at night, at high altitudes, under conditions where downwind orientation cannot be explained by visual assessment of movement relative to the ground or by compass mechanisms. A collaboration between mathematical modellers and biologists has now revealed that these insects are responding to the effects of turbulence. Insects possess sensors that are capable of detecting extremely faint air movements. The migrating insects will be bounced around in the turbulence, and the authors conclude that the insects are able to use the turbulence to sense which direction the air is moving. In response to this buffeting they alter their vertical profile and direction, increasing both speed and migration distance. This mechanism also predicts that insects flying in the Northern Hemisphere, will typically be offset to the right of the mean wind line, as a consequence of the Earth’s rotation. The researchers report on the first evidence for this effect in their data from insect-monitoring radars. The findings have clear implications for the accurate prediction of the flight trajectories of migrating nocturnal insects. “Over long distances even these relatively small but consistent offsets have significant effects on the destination of the migrating insects and should be taken into account when predicting the flight trajectories of migrating insects” said Reynolds. This is particularly important when designing forecasting models to predict the movement of insect pests.